SpiritMD, Suction Easy™, STICKIT™ and this site are all © Spirit Creations, Inc.
To provide a complete NHTS EMT-basic refresher course, it is essential that the training include the use of a meter dose inhaler (MDI) device. 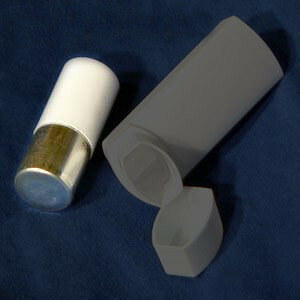 Metered dose inhalers (MDIs) are hand-held devices that utilize propellants which are pressurized to deliver doses of medication to a patient's lungs. Extremely useful and critically important to public health, these delivery devices are designed to administer a variety of active ingrediants for a range of medical conditions. Using MDI correctly means a responder can provide treatment for a patient in respiratory distress. Correct facilitation means the medication being administered has a better chance to reach the small airways, which increases the medication's effectiveness. Using a good technique can also help reduce the side effects of medications. The MDI Training Kit is a key tool for education. Recent studies show the importance of training people with chronic obstructive pulmonary disease on the proper usage of metered dose inhalers. Training resulted in nearly 85% of the trained using their devices correctly 3 months after training while none of the control group did. 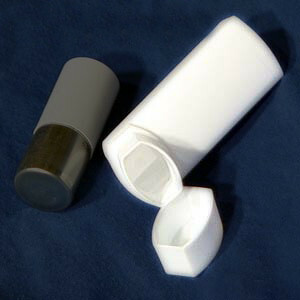 The device consists of a placebo metal canister and a white plastic actuators pricing below for kits or indiviual parts. "The student should practice the steps in facilitation the use of a handheld inhaler... Needed: handheld inhaler suitable for training purposes." NHTS 1996 Release of EMT-Basic Refresher: National Standard Curriculum (06/06/96) Module IV-medical Behaviorial. SPIRITMD.COM Offers the only COMPLETE MDI PACKAGE for your courses. 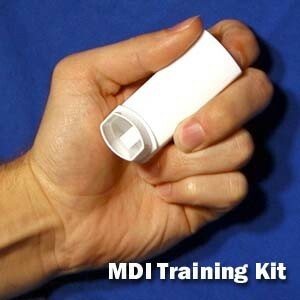 MDI placebo canisters and disposable actuators are available in training kits and individual quantities. These placebo canisters are filled with propellant only, no medication, so the trainees can practice administration on themselves and others safely. Each canister contains approx. two hundred metered doses. One disposable actuator is provided per trainee. 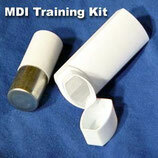 The MDI placebo canisters are changed from actuator to actuator at the training stations. MDI Placebo Training Kits and Components are available exclusively through Boundtree Parr, LLC., Galloway, OH and this website! Use this form to Order SpiritMD products with a P.O.#or if you are tax-exempt and in the state of Pennsylvania. us directly at info@spiritmd.com or 724-325-4466.